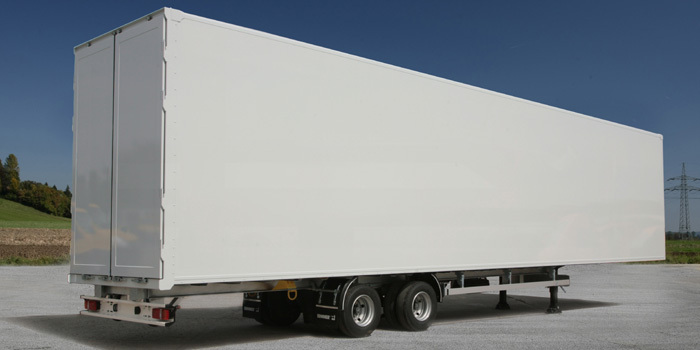 The transport of stage and event equipment makes special demands on the type of vehicle used. In many cases customers focus on large loading volume at low cargo weight. Therefore SUMMER offers event semi-trailers with interior heights of up to 3.25 meters in the rear. In this variant, the event sem-trailer has an inclining floor. This facilitates the loading from the ground due to the extremely low loading sill. However, the ground is flat without disturbing bend in the neck area. The box body made of Plywood or Aluwood is extremely stable and keeps the cargo dry in any condition. In the rear container doors with four espagnolettes ensure a safe storage of the valuable cargo. For loading and unloading, the doors can swing open completely. As standard, the SOMMER event semi-trailer is provided with a translucent plastic roof. Cargo securing devices are also available as an interior lighting or even heating.